Literally meaning 'Beautiful Death' the Shantakai was constructed by one of the most fearsome shinobi of an older generation: Mezon, Kengen.. A shinobi from Sunagakure with a strong passion for politics. Growing up he hoped to be a diplomat for his country until one day he was told that we would never be powerful enough to succeed to anything. Desperate to achieve his goals Kengen soon defected from his nation, hoping to travel to Iwagakure to see if his aspirations could be achieved there. Being a part of the Rock Village for another four years, Kengen seemed to prove his former Sungakure superiors wrong becoming one of the finest shinobi in Iwagakure. Working in a duo along side a fellow Iwagakure shinobi who both were sent on an assassination mission deep in Rain Country, little did either of them know this was a mere test of who would come out on top as the Tsuchikage told Kengen's comrade that his secondary goal was to place a loyalty seal on the latter to ensure he would serve the Tsuchikage without hesitation. So once the assassination had been completed, Kengen's comrade attempted to strike at a time where Kengen's guard was let down, but was unsuccessful which resulted into Kengen slaying his comrade after a short struggle. Feeling betrayed by his Kage and his nation, thinking that his comrade had tried to kill him. Kengen started to think there was going to be no way to achieve dream. Still sitting aside his bloody lifeless comrade, a figure emerged from the bushes. Kengen was not hesitant to fight but was quickly overwhelmed by the man. Identifying himself as Sakumo Aburame, the two soon set out on a journey to Kirigakure to track down the last piece of the puzzle the two had begun to construct, tracking down a third shinobi by the name of Han Jugoru. After a short physical persuasion, Han agreed to join the two soon after creating a grey and black uniform and calling themselves Shantakai. The three soon became nine as Sakumo, Han and Kengen each led a squadron of three, Kengen filling the main leadership role the group set out to wage war on Iwagakure and Sunagakure due to Kengen's personal issues with the nations, the rest of the group seeming to blindly follow, the Shantakai ended up reaching a strong eighteen, which was structured of six trios. Each member had their own personal goals which Kengen said he would help them achieve if they all united to achieve his two, believing that if he eliminated the Rock and Sand villages he would have nobody to oppose him when it came to his political career, which blinded him so much he often referred to the Shantakai as his cabinet. Before an official attack could commence, internal conflicts started occurring within the organization as one of their members a kunoichi in the group known as Ayame Tenchu was killing her own team mates, he was too valuable to just dispose of so Kengen placed him under Sakumo's watchful eyes. As they finally prepared to begin their assault on Sunagakure little did they know that Ayame had actually informed the nation, who received assistance from Iwagakure as well as the Shogun and his army. Ready to infiltrate Sunagakure, wiping it's existence from the face of Earth, little did they know they were walking into a trap. Being completely surrounded, no option to retreat, they would fight off hundreds of opponents, before they suffered their own causalities, by Ayame's own traitorous weapon, Sakumo and Han then broke from the pack as they pursued the fleeing Ayame followed by a small portion of the Shogun's army, they quickly dispatched of them as they caught up to Ayame the battle beginning between the three as Ayame defended herself from her superiors, who seemingly were outmatching him. The Kazekage himself shielding Ayame from a finishing blow before facing off with Sakumo, whilst Han continued to continue with the onslaught with Ayame. The Kazekage and Sakumo drawing attention to themselves as both parties received back up but were quickly disposed of by the opposing forces, Sakumo eventually landing a successful blow which allowed him to infect the Kazekage with his Poisonous Nano Insects, leaving the Wind Shadow to rot as he reunited with Han in his last moments as Ayame overcame him with a swift slice of her blade It was here when Sakumo and Ayame would engage in a battle of the ages. Meanwhile, back at the main ambush location, the Shantakai continued to fight to the point that the Shogun and Tsuchikage joined the battle and attempted to finish off the remainder of the Shantakai. Eventually Kengen and his apprentice Y knew they would have to, the Kengen knew the only way he could beat the Shogun was to seal his soul away, finally being able to get his palm on the Shogun when Y had provided Kengen with assistance to distract the Shogun, Kengen sealed the Shogun's soul away, resulting in both of their deaths as the sacrificers soul was forever tied with the sacrifice. With the Shogun dead, the armies began to retreat as the Tsuchikage prepared to wipe out the remaining Shantakai with his personal trump card of his Dust Release techniques, which was the reason why the armies were truly retreating. The remaining four Shantakai quickly attempted to retreat too, as the Tsuchikage's jutsu released, obliterating everything in the area. At the same time, the battle between Ayame and Sakumo came to an end as Sakumo was preparing to strike down Ayame for her treason, only to be interrupted by the explosion that had enough distance to even reach them, consuming the sandy forest they were in entirely. The field cleared as the whole area was silent, the Earth now displayed as the sand that was there before hand was completely obliterated. Sakumo rose from a pile of grains, wiping himself off as he looked for Ayames body which was nowhere to be found, assuming he was dead, Sakumo was disappointed as he wanted to add his body to his collection, it seemed the bodies of Han and the Kazekage were also destroyed in the blast, moving back to battlefield he witnessed the aftermath of the Tsuchikage's last resort technique. The only body he could still see was the body of the Tsuchikage. Slinging the battered corpse over his shoulder he quickly retreated before the army could make itself way back. Shortly after he was found by Y who was the only other member to survive the blast, or so they thought not knowing that Ayame had escaped just before death had him in it's grasp. A conversation transpired between the two survivors which led to them planning to rebuild the organization, this time Y taking the leadership role. Sakumo's knowledge helped them track down more skilled criminals, eventually reaching a total six members, a small number but each member having incredible power that succeeded the former Shantakai. Now with a mere two squads led by Y and Sakumo. A decade passed as they lurked in the shadows, gathering new members one by one until they reached the number of six, discovering that the nine tailed beasts had once again been brought to Earth which led them to believe an old story about the beasts, sealing them into a single location will unlock an unmatched power and bestow it upon to the people who captured the beasts, allowing them to separate the beasts chakra amongst them and become the most powerful force known to man. Setting out to achieve this goal, they continued to operate in the shadows, tracking down the most powerful of all the beasts first, Kyuubi. The Kyuubi Jinchuuriki was previously aligned with the Mist Village who had defected from his village, making him an easy target; Sakumo and his team managed to seize the beast and seal it into their sacred monument, killing the Jinchuuriki in the process. This being one of another eight that would soon follow, but it would be soon when they would have to reveal themselves once more, in order to capture some of these powerful beasts. Since reforming the overall head count has dropped dramatically, though it was decided that for now a smaller group would function more secretly as compared to a large group. The Shantakai have traditionally worked in teams of three, who follows the command of a team leader. Each team leader may have different methods when it comes to leading their team but all of them are usually heading to the same path, merely by different paths. These trios have always been placed with one another not based on emotional chemistry of said members but the effectiveness they can complete tasks and how well their abilities complement one another. Because of these attributes these trios are probably the most overwhelming and powerful groups that walk the Earth today. The Shantakai try to remain as direct to their missions as possible but since they consistent of hot-headed degenerates The Shantakai members were always well known for their ability to cause unpredictable havoc and when the group reveals itself again it is highly doubted that these attributes will change. The Shantakai have recently undergone a outfit makeover, since their previous robes used to be black with golden and silver trimmings as opposed to the current robes that are black and grey, still keeping their symbol which is a black circle inside a ring that has another four hollow circles on it. This symbol is recognized as the Shantakai symbol and older shinobi would certainly recognize it. The robes that the Shantakai currently wear reach down to their ankles, which is actually separated around the legs to ensure movement isn't restricted. Female robes have a looser bottom in case they want to use their legs for some sort of seduction. 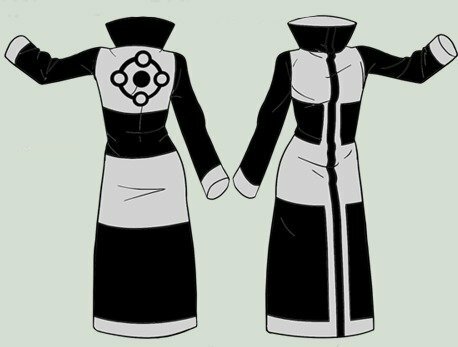 The sleeves are quite long, not bothersome long but long enough to hide a wearers entire arm if they hadn't pulled their sleeves up or revealing their hands, this allows them to sneak in a quick projectile attack usually undetected. The collar of the quite high, most members usually use it to conceal their lower face a bit more and it helps provide warmth during harsh traveling conditions but the collar can easily be popped out. 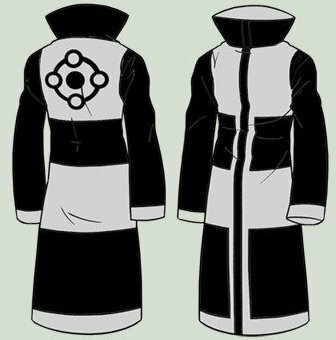 The robe itself is extremely durable and will not just burn away if caught on fire or struck by lightning, it can be cut through cut almost as easy as a normal coat, but its triple layered inside allows for a slight soften to a devastating blow, the cloak is in no way an armor however. These layers are warm up of grey wool which practically allows the robe to act as a blanket. Since their reconstruction, The Shantakai directed themselves towards a larger goal, not only overthrowing the major nations, but the entire ninja world by toppling the government and seizing the ranking of Shogun. 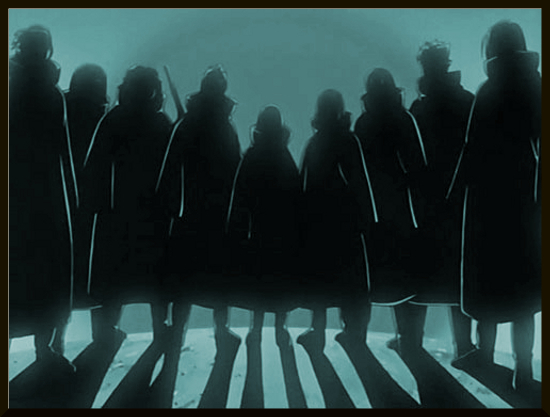 To achieve this they realized that with the recent rediscovery of the Tailed Beasts, they would be perfect to capture and extract their chakra, so eventually when they had collected all nine they would become the strongest unit of shinobi the world had ever seen. Still lurking in the shadows the Shantakai prepare to strike sooner than later. The Shantakai is ruled, organised and administer by the Shantakai Leader with the assistance of Adam. He appoints members, assigns teams and fulfills all other in character administrative functions.